thanks for comments, sure I have a version within the anti-warping pads. see attached. are you able to create a Flower of life bauble in different dimensions? hi Jaladi, yes i can make in different dimensions. the current size is my personal favourite, but i can make in any size really. what i found was that the smaller the seed, the more the retraction is an issue. below are 2 other size you can download and try. this is the best iPhone-6 case. fits great. Printed with wood PLA, and it came out great. love the details. great work! Fitts perfectly. Many thanks for sharing! I made this phone case and decorated it and I love it! Say thanks by giving sybu a tip and help them continue to share amazing Things with the Thingiverse community. 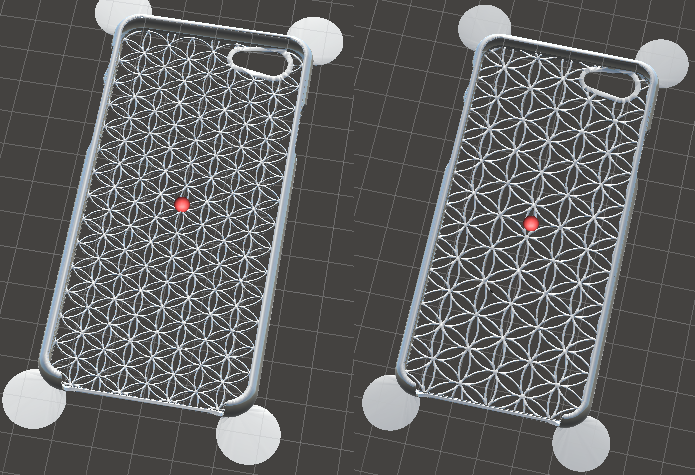 Very thin iPhone 6/6S case with tactile feel - Flower of Life design by sybu is licensed under the Creative Commons - Attribution - Non-Commercial - No Derivatives license. Say thanks and help sybu continue to share amazing Things with the Thingiverse community. You'll need a PayPal account to tip sybu. Click the button below and you will be redirected to PayPal. Once the payment is complete, you'll be brought back to Thingiverse.